Here is the Ctown Flyer Sale, valid April 19 – April 25, 2019. 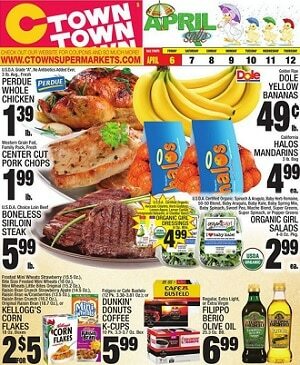 Save with this week Ctown Ad grocery specials and fresh deli specialties & discounts. Super savings for Maxwell House Coffee, Del Monte Pineapple in Juice, Ragu Pasta Sauce, Filippo Berio Extra Virgin Olive Oil, Baker’s Coconut Flakes, Pringles Potato Crisps, Breakstone’s Sour Cream, Fage Total Plain Greek Yogurt and Oscar Mayer Sliced Bacon, Wild Caught Tuna Steaks, Texas Pete Buffalo Wing Sauce, Krasdale Onion Rings, Krasdale Spinach, Organic Nasoya Tofu, Poland Spring Water.